Baraka Canada was conceived in 2013 by a small group of enthusiastic travellers, several of whom had already served on the board of Baraka UK. The original goal was to support medical trips to Zambia by building a working relationship between Peace Arch Hospital in White Rock, BC and Kabwe Hospital in Zambia. 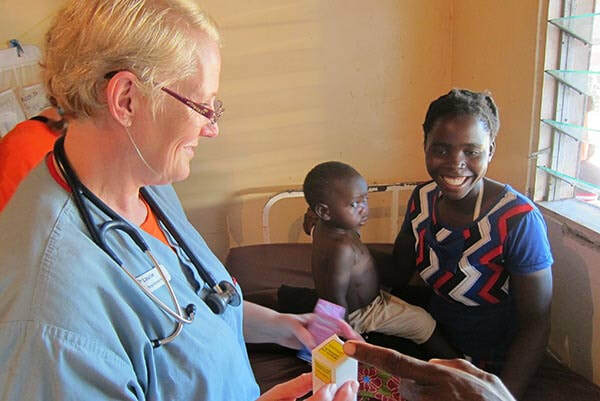 ​Over the last four years, Baraka Canada has sent three separate teams of doctors and nurses out to Zambia to set up temporary clinics in rural locations. More recently, the Canadian contingent’s scope has broadened to include fund-raising activities and educational presentations in Canadian schools. In May 2017, Baraka Canada completed its third successful medical trip to Zambia. In the space of two weeks, the group saw over 1300 patients in four separate locations and dealt with a multitude of ailments, including malaria, HIV, intestinal parasites, infectious diseases and even crocodile bites. The group arrived with a large supply of medications donated from Canada. They set up clinics in empty schools and youth centres where patients could be examined by doctors, make use of a makeshift pharmacy, and get special help in a treatment room where one of the doctors performed minor operations. Serious cases were referred by the medical staff to local Zambian hospitals. "The Baraka medical program in Zambia is a vital component in a community partnership which yields high dividends for both the locals as well as those of us on the team. I left Zambia with a fresh love for my profession and I can hardly wait to return and continue building these life changing relationships.”"
In tandem with their UK counterparts, Baraka Canada works to encourage local communities to come up with their own sustainable solutions. Our medical trips are competently supported by Baraka’s on-the-ground staff in Kabwe, Lusaka and Lake Kariba, including beneficiaries of our sponsored kids programme. ​These young adults act as translators for the doctors and nurses and, in some cases, help out with wound dressings, pharmaceutical distribution and surgical assists. We are proud to be involved in what has become a real Canada-Zambia team effort.